Damn it. Last night we missed happy hour at Mary Ann's by 30 minutes. But we still stuck around because it's hard to say no to Mexican food (especially when your other alternative is healthy stir fry at home) and Margarita always sounds/tastes/looks good. 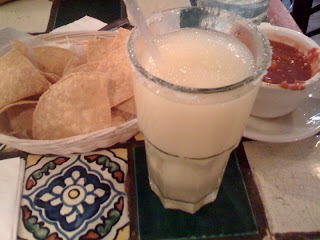 Pint of perfect frozen Margarita . 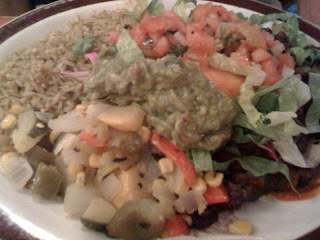 . .
One half of us has high cholesterol, which means having to eat a Vegetarian tostado. But I think calling it "vegetarian" is a bit deceptive when you think of the lard and other crap they must put into this dish. The other half of us has a perfect cholesterol level, which means a lot of cheese and meat (thankfully). 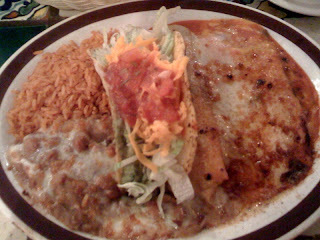 The Azteca - Cheese chile relleno, tomatillo chicken enchilada, and gaucamole taco, served with rice and beans. Tacos and Margarita - waaaaay more fun than veg stir fry any day. Q-Tip at Central Park Summer Stage!! !